In an attempt to write reviews every month, I've failed miserably - but I do have two reviews that I'd like to share with you all. 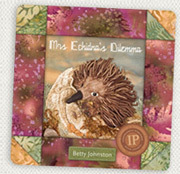 One is a great new book called Mrs Echidna's Dilemma by Betty Johnston. Mrs Echidna's Dilemma was orginally written as a resource for early learning resources, but has since been released through 3E Innovative as a picture story book. The illustrations have been taken from an award winning quilt that Betty Johnston created and entered into the Queensland Quilt Show 2009. This book has a wonderful simple narrative, with extra factual information on each of the animals in the story. The story follows an echidna's journey to find the perfect place to lay her eggs. Each page focuses on a different animal, with a lovely textured illustration for little hands to touch and experience. The information on the left hand side of the page provides in depth information about the breeding patterns of each animal. My 5 year old daughter really enjoyed the story and was interested to go back once we had read the book, to find out more information about the animals. I really enjoyed this side of it too - to have both a story and same factual information made the reading of this story more involved for both of us. Johnston also provides patterns for finger puppets and a DVD to accompany the book. We haven't managed to make any yet, but my daughter definitely wants to!! I enjoyed the different aspects of this book, and although I initially thought it was a bit old fashioned, my children certainly enjoyed the textured pictures and the extra factual information. Mrs Echidna's Dilemma is available at http://mrsechidna.com/shop and was set for release in late September. My second review is about a movie due for release in early November this year. 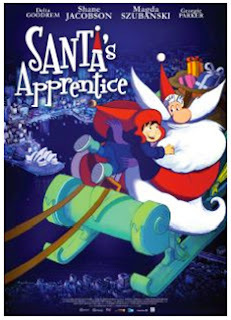 It's called SANTA'S APPRENTICE and is a Christmas animated adventure, following the journey of a 7 year old boy called Nicolas as he comes to terms with being the next Santa Claus. It has an all star voice cast including Magda Szubanski, Shane Jacobsen, Delta Goodrem, Hugh Sheridan and Georgie Parker. I decided that I would take my two children (aged 7 and 5) and we trundled off to the city for an adventure! Both my children really enjoyed the movie. There was a lot of conversation after the film about Santa and both kids wanted to talk about Nicolas being an orphan and what that meant - so there was some great conversation starters!! The kids loved seeing inside Santa's toy shop and were interested the whole way through. I enjoyed the film too - I was worried at the start when there were some conversations about Santa not being real (My kids are still true belivers) but thankfully my children didn't take much notice of that! The animation was great too - it felt like it was influenced by the animae in Japanese cartoons. Overall I'd recommend this film to people with younger children - it brought in lots of different topics to discuss afterwards, as well as being just a easy film to watch.